Personally, my day ruined by #ExtinctionRebellion as I dashed around London on Wikileaks related stuff and lost a couple of hours to transport disruption. But this is what it takes to jolt people from complacency to see the existential threat we ignore. Many congrats to them. We wrote this week about the massive Extinction Rebellion protests that shut down London traffic in an effort to push the UK government to “tell the truth about climate change”, reduce carbon emissions to zero by 2025, and create a citizens’ assembly to oversee progress. There are also satellite demonstrations happening in the United States as the movement gains more traction overall. While many people undoubtedly were angered by the disruption of their commutes, former British diplomat Craig Murray had an incredibly refreshing take. Instead of tweeting profanity at the protestors he thanked them for stopping him and making him think. Why This Matters: Even in cities where the population tends to be better educated and more liberal, people acknowledge that climate change is happening but don’t devote much time to thinking about its implications or how they can act to make a difference. Protests that jam up city traffic might have to become the answer to jolt ourselves awake and face the dire urgency of climate change. Thanks to Craig for giving us the reminder to pause, listen, and think before we get angry. Why This Matters: Climate change continues to resonate with the public and the media — and the economic and security aspects of the issue are intertwined in ways that can appeal to both the liberals and conservatives. Whether it is the Green New Deal as a policy response to climate change or the national security threat posed by climate change, it remains in the forefront of public debate in the Presidential campaign, in Congress, and on Fox News. Perhaps Buttigieg (whose star is rising fast) framed the issue best when in one sentence he managed to position climate change as both an existential threat to our lives and our prosperity — and made it generational to boot. And it is most definitely a generational issue — as evidenced by the lastest mini-film by Representative Alexandria Ocasio-Cortez imagining looking back on this time when the mobilization to meet the climate change challenge began. You can watch it below. TNC CEO Mark Tercek unveiled the plan in a TED talk in Vancouver this week and as The Fish Site explained, it was “selected from more than 1,500 TED Audacious Project applicants, has already secured more than $23 million in funding from various donors out of the $40 million TNC ultimately requires to unlock $1.6 billion toward marine conservation.” In addition, in exchange for more stringent ocean protection and conservation, TNC says the Blue Bond will give nations better terms for debt repayment and support with ongoing conservation work. You can learn more about the specifics of how the program works here. “TNC has been a leader in debt-for-nature conservation, working since 2001 to negotiate deals like this for the protection of tropical forests. In 2016, they tried this approach in the Seychelles, restructuring $22 million in debt in exchange for the protection of 400,000 square kilometers of ocean — an area the size of Germany. It’s been incredibly successful, but the deal took years to complete. Now The Nature Conservancy plans to build a team that can close these deals much more quickly. Over the next five years, they will negotiate deals in 20 island and coastal nations, and together create more than 4 million square kilometers of marine-protected areas. Why This Matters: We’re running out of time to stop and reverse damage to the world’s oceans. Marine environments, fish stocks, and biodiversity are all threatened and without a healthy ocean, the fate of human life becomes compromised. Isabella Lövin, Sweden’s Foreign Minister for International Development Cooperation, put it more bluntly by saying that if we don’t protect the ocean, humanitarian disaster awaits. The Governor of Kentucky, Republican Matt Bevin, is considering whether to declare a state of emergency that would unlock resources to repair the dilapidated water system in Martin County, Kentucky deep in the heart of coal country. In the meantime, the residents there must buy bottled water or hope for donated water in order to keep from drinking the tap water while they wait for action. The Washington Post published an exposé on how years of deterioration in the pipes, mismanagement by the local public service commission, and an inability to raise rates to pay for repairs have created a $10 million price tag to fix the broken system. Residents in the county have been dealing with the water issue for decades — but things reached a crisis point last year when water service to many county residents was turned off, the county water board fell apart, and the state Attorney General opened a criminal investigation into mismanagement there, according to The Post. While the state legislature passed a resolution encouraging the Governor to declare an emergency, but the Governor is still on the fence, promising more funding to turn things around. The county is deeply in debt and forty percent of the residents live below the poverty line, and both the coal mines and the coal severance funds are now gone. It is hard to see how the county can rebuild without significant outside help. And complicating things there is that the county is so small with complicated topography that the costs for repairs are difficult and extremely high per capita. Martin County, according to the American Society of Civil Engineers, is hardly an exception — they gave the nation’s drinking water system a D grade in a recent report. Many water systems across the country are dependent upon water systems that are 25 years beyond their life expectancy and beset by leaks. The American Water Works Association estimates, according to The Post, that the country will need to spend $1 trillion over the next 25 years to repair all the water systems that will fail completely during that time. Why This Matters: The bill is about to come due for our country’s aging water infrastructure system. Flint, Michigan and Martin County, Kentucky’s water problems are occurring with increasing frequency across the U.S. — in rural areas and in cities. The country needs a major investment to rebuild these systems. The Marshall Plan analogy is fitting. The price tag is indeed high, but, providing clean drinking water to all Americans is something we must find a way to fund. Many ask how will we pay for a Green New Deal, of which replacing this aging infrastructure is a key component. We wonder how anyone can think we can continue to delay infrastructure spending indefinitely. To Go Deeper: Worth your time is this longer story The New Republic published last year on the rural drinking water crisis in the U.S.
NASA announced on Tuesday that astronaut Christina Koch will have her mission on the International Space Station extended and will likely break the record for the longest spaceflight by a woman (currently, NASA astronaut Peggy Whitson holds that record with 288 days). As Space.com explained, “Koch, who launched to the space station on March 14 with colleague Nick Hague and Russian cosmonaut Alexey Ovchinin, will remain in orbit for 328 days, returning to Earth in February 2020, according to the new flight schedule.” Since space station missions typically last for about six and a half months, the extension of Koch’s flight will help NASA gather more data on how human bodies respond to longer spaceflights. Her mission is planned to be just shy of the longest single spaceflight by a NASA astronaut – 340 days, set by former NASA astronaut Scott Kelly during his one-year mission in 2015-16. Koch’s extended mission will help scientists gather additional data about the effects of long-duration human spaceflight beyond those of the normal six-month station expedition. Such research is essential to support future deep space exploration missions to the Moon and Mars. 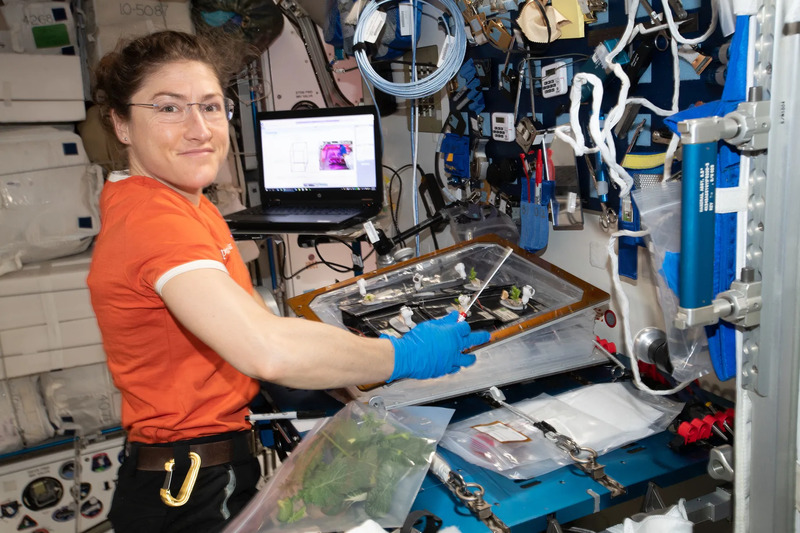 NASA has gathered vast amounts of data on astronaut health and performance over the past 50 years and has focused recently on extended durations up to one year with the dedicated mission of Scott Kelly and extended mission of Peggy Whitson. These opportunities also have demonstrated that there is a significant degree of variability in human response to spaceflight and it’s important to determine the acceptable degree of change for both men and women. Why This Matters: Koch’s research will lay the groundwork for more advanced space missions in the future, like going to Mars! If you remember, Christina Koch was supposed to be part of the first all-female spacewalk that didn’t end up happening as planned last month. We hope she sets this new record, as we’ll be cheering her on from Earth! You can follow Koch’s updates live on Twitter. A cool thing: Did you happen to see the fireball meteor that exploded over the night sky on the East Coast Tuesday night? If you missed it the footage is pretty cool! After Monday’s tragic fire that ravaged Paris’ Notre-Dame cathedral, French President Emmanuel Macron expressed that “the worst has been avoided” and vowed to immediately begin the process of rebuilding the 856-year-old church. While the main structure of the cathedral survived, the wooden roof was destroyed and replacing it with comparable oak will be impossible as France no longer has trees big enough to replace the beams. As Fortune explained, the wood for the ceiling was “first felled around 1160 to 1170, with some of it coming from trees thought to be 300 to 400 years old at the time they were chopped. That puts the oldest timber in the cathedral at nearly 1,300 years old.” Bertrand de Feydeau, vice president of the preservation group Fondation du Patrimoine, explained that trees which supplied the roof’s frame came from primary forests—forests that are largely untouched by human activity, and he surmised that the huge trees associated with primary forests are gone too. Only 4% of Europe’s remaining woodland is primary forest (old growth), according to a study published last May, with none larger than 500 square kilometers outside of Russia or Northern Europe. In France specifically, while forest covers nearly 1/3 of country, just .01% of it is primary forest that contains trees between 200-400 years old. In addition to the fact that old growth trees are no longer available to rebuild the roof of Notre-Dame, pollution has been compromising the structure for many years as well. As Weather.com reported, “flying buttresses that support the entire cathedral have been darkened by pollution and eroded by rainwater and acid rain has eaten away at limestone decorations. Gargoyles, originally designed to carry rainwater away from the building, have fallen off the building.” The stone of the cathedral has become eroded in large part due to the pollution resulting from traffic congestion in Paris. Why This Matters: While the fire at Notre-Dame was not connected to climate change, the phenomenon will nonetheless put countless landmarks we cherish at risk (like the Statue of Liberty here in the United States, or Peru’s Machu Pichu). If we want to protect the greatest testaments of human civilization and leave them for our children and grandchildren to cherish then we must become far better stewards of our planet and work to curb climate change and protect our land, air, and water. We cannot allow the heartache that was witnessed around the world in response to Notre-Dame to become the norm.